A technical guide on reduced tillage and its implementation in organic agriculture. The technical guide, which is available in German only, was produced in collaboration with the TILMAN-ORG project. The guide can be downloaded from the FiBL shop, where also the printed version is available. 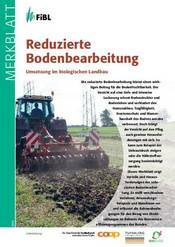 shop.fibl.org: Technical Note "Reduzierte Bodenbearbeitung - Umsetzung im biologsichen Landbau"
This guide gives a brief overview of the biology, ecology and the multiple services of earth-worms to farmers and provides recommendations for the promotion of these extraordinary creatures in agricultural soils.